Eight Icons and Illustrations, scanned from power tool manual brochures, then touched up in Photoshop. I don't normally like to scan images from books and pinch other peoples work, but this one is an exception. 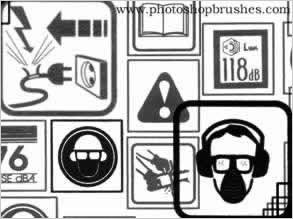 The images are scanned from power tool manuals featuring the Bosch Angle grinder and Mc Cullock Chain Saw, I have also added a selection of warning icons that I like. There are also a selection of Quake 3 Icons brushes available on the Photoshop Brushes website, these might also be of some interest.